Offered here is an original and rare MUTOSCOPE ARCADE CARD from the 1940’s. The art is done by talented pin-up artist, BILLY DEVORSS. This card is considered ‘RARE’ by the knowledgeable folks at MUTOWORLD. The card is a lithograph on heavy card stock and measures 5 1/4″ by 3 1/4″. This item is in Near Mint+ condition – as close to flawless as it gets. I chose not to scan the back because there are simply NO imperfections. If I were to pay to get this graded, the price would be in the $100 range. Keep in mind the large image is enlarged by TWICE the size of the original card. This is high quality cheesecake from when the pin-up was in its’ heyday. Categories: ART, PRINTS & PORTFOLIOS, PAPER PRODUCTS, MISC, TRADING CARDS. Tags: collectibles, art, Billy Devorss, cheesecake, Devorss, Feather Your Nest, illustration, mutoscope, pin up, Pop Culture. 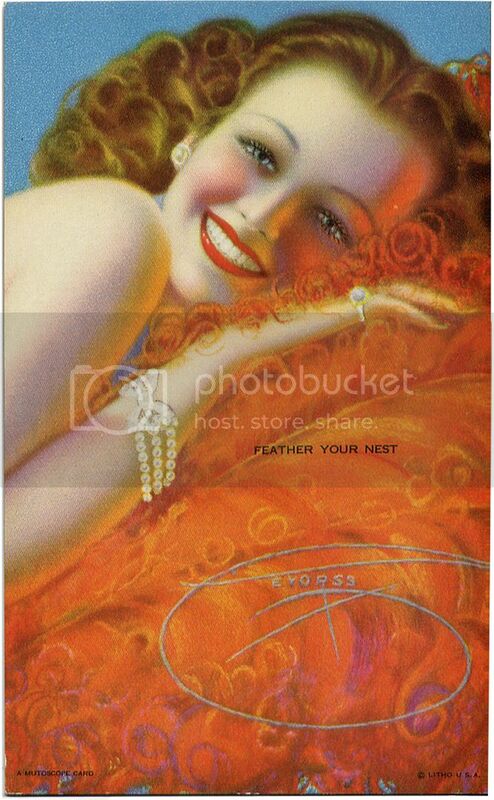 Be the first to review “FEATHER YOUR NEST BILLY DEVORSS CHEESECAKE PIN-UP Mutoscope Card RARE (1940’s)” Click here to cancel reply.